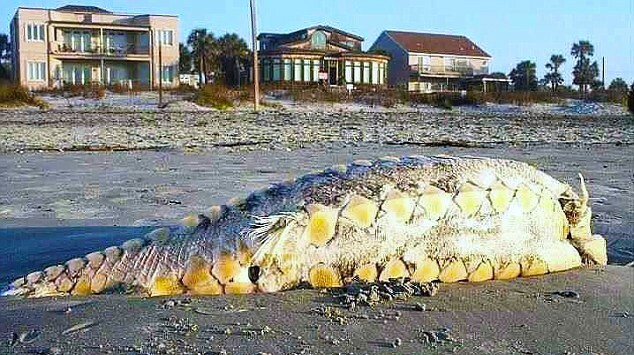 What Has Washed Up On The Shores Of South Carolina? So something else has crawled out of the depths of the ocean to land on our shore. Though it looks like something new, and unnamable, the South Carolina sea monster has been identified as a prehistoric Atlantic Sturgeon. Sturgeon have been around for approximately 100 million years. They have survived extinction after extinction, and have been around for most of the big changes our planet has gone through. But even with a hide of stone, these unique creatures have met their match. These are amazing specimens. Covered in a bone plating called scutes rather than the usual scales seen on your daily catches. The average Atlantic Sturgeon is 10 ft long and weighs in at approximately 300 lbs, however they have been seen, as is the case with the guy above, to grow 15 ft long and 800 lbs. Here in North Dakota they are trying to thrive in the Missouri River, and from time to time someone might snag one. But, no fisherman is allowed to bring that fish in the boat, on shore, or even touch it. I like that. Other places/states actually have a season to fish for Sturgeon. There are places, like in Maryland, that have been desperately trying to recover the Sturgeon population, but it has been tough. This is what I have to ask you though. Why all the sudden are we finding all these exotic creatures in our backyards, and on our beaches? Why is it that some of the worlds most well hidden secrets are rising to the surface so to speak? I ask this because I have my own answer but would like to hear others. What do you think? This entry was posted on March 29, 2012 by David Joseph. It was filed under Strange Reports and was tagged with Atlantic Sturgeon, Cryptozoology, Deep ones, giant monster, ocean, Sea Monster. Amazing creature, just what is going on in the depths of the ocean? Fantastic blog entry by Unspeakable Gibberer. Thought provoking, it really does make you wonder what else could be down there, and what could be stirring? Incredible, frankly, huge thanks for sharing this picture and the story behind it. be the polluted air that is doing them in. Well that title might tick off the Sturgeon even more! What I’m wondering now is, what if it didn’t wash ashore but was placed there by some larger unfathomable creature from the deep? Maybe James Cameron’s recent solo trip 7 miles below the sea level stirred up some nasty sea creatures that are awakening? We can only dream! Well, we are about two years removed from the biggest oil spill in history. 4.9 million barrels of oil is a lot, and even with the clean up efforts, oil still remains. Add to that the Gulf Stream which goes all the way up the east coast of America, so all that oil has spread further than just in the Gulf of Mexico. As stewards of the Earth we need to do a better job! I live on the shores of Lake Champlain. Lake Champlain is supposed to be the home of the notorious Lake Champlain Monster a.k.a. “Champy.” One of the competing theories of what Champy actually is is that he’s an enormous sturgeon. Give it a rest about the oil spill. That oil was made by the earth, came from the earth, and has been doing so for long before humanity knew it existed. The planet and environment have methods for dealing with things like that. There are bacteria that eat oil and a lot of it just goes back into the earth. Yes, we did cause the spill, but the earth has been leaching oil from it’s depths (almost all of it in the oceans) since before man even existed. If the oil spill was causing the things they have been saying it is causing, we would have been seeing this stuff happening in the past without oil spills. Maybe, but a huge uncontrolled spill is something that the earth probably wasn’t ready for. Over a period of time I am sure there might be an oil leak here or there from the ocean floor, but im sure it’s never a leak that effects the eco-system of our oceans. Huge population changes due to “human error” are something that this planet has dealt with but has shown that it doesn’t cope well. In the ocean it’s eat or be eaten, so when that food, especially life forms that aren’t evolved to clean raw oil off them, die off from our mistakes. Im sure a lot of land dwelling animals can’t digest oil covered fish, eels, or other birds that were caught in the oil patch. Because I am curious, Joseph, I was wondering if you have a source of information that I can look at that would educate me about how much oil the ocean takes on naturally, and about the bacteria that helps in neutralizing it. Thanks for your comment! Yes, but 4.9 million barrels of oil were not floating around in the waters of the Gulf of Mexico all at one time until us humans put it there. And no, I won’t give it a rest. It’s attitudes like that that have let Big Oil and other companies run rapshod over our environment. You might not think that is a big deal, but I do. Maybe what washed up on the shores of South Carolina was not caused by the BP oil spill, but the far reaching effects of this latest blunder have yet to be seen. So, you can’t say it won’t have an effect. Well, I guess you could, but to me that is just another way of saying we have no effect on the environment, which I believe to be furthest from the truth.